Thank you so much for the kind comments on yesterday's post. It's nice to feel things turning around in the eleventh hour of 2014. My foot has been feeling really good, and yesterday, I didn't feel any twinges of pain at all. I know I said I was going to wait until next year to start running again, but I was really in the mood to try it out today. The weather was nice (cold, but no wind), so as soon as the boys left for church with my parents, I headed out for a run. I wasn't sure how far I would run--it just depended on how my foot felt. I wore my Paradigms, and my feet were feeling good. 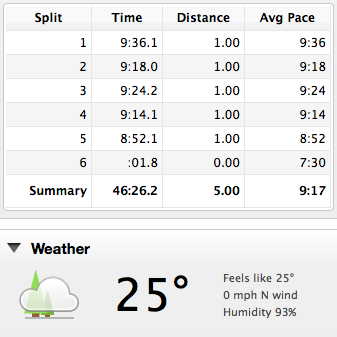 I had no idea what my pace was going to be, but I just kind of ran however I felt like running. I was hoping for an easy sub-10:00 pace, and kind of surprisingly, I was managing 9:15-9:30 ish. I didn't feel a single twinge of pain as I ran down my street, so I hoped it'd stay that way. 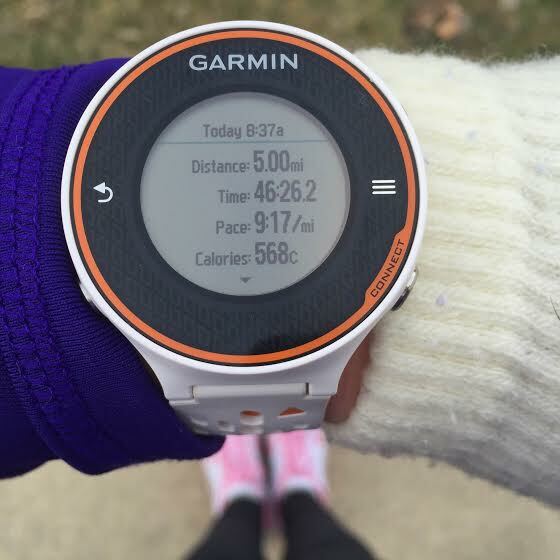 After I ran just past my house, and hit the five-mile mark, I stopped my watch. I was really happy with my run! I didn't have any pain at all, and I ran a decent pace the whole way through. Just because I ran today, I'm not going to jump right back into training; I'm going to take it very easy the rest of the year. If I feel like running, I'll run; but if not, I won't. I don't want to risk overtraining again, so I'm going to take it very easy. But it felt good to get out and run, instead of feeling lethargic and lazy! Tomorrow is Motivational Monday, and I meant to mention that I added a tab at the top of my blog for "Motivational Monday". There, I explained how to submit a Motivational Monday if you'd like to share something. I love reading about your accomplishments! I set up an email address that is specifically for Motivational Monday, to help keep things organized (for me, anyway). So if you have anything to share, please just click there and it'll explain it better. Don't you love it when you have a great run after having some not so great ones! ?